It's the holiday season again, and it's time for the company party. Whether it's a Christmas, New Year, or Year End Party, your company is having one, and it's fantastic. You go to a great deal of effort for the party, but your employees seem somewhat unenthusiastic. Why is that? Here are ten reasons why your employees loathe the holiday party. Here's a little hint: If something costs money, it's not a party. Sure, your employees may have fun, but a party is something the host gives to his guests. In college, everyone chipped in for food and drink, but this isn't college. When you make employees buy a ticket for themselves and their plus one (if allowed to attend), it doesn't feel like a gift from the employer. This makes sense, of course, because it's not. Even if the business is covering the vast majority of the cost, employees don't want to have to pay to go to a party. It's your company, so you want just the employees there. That makes perfect sense, except that your employees see you and each other all day every day. They want to spend the weekend and their evenings with their significant others. While adult only evenings are great, if a lot of your staff has young children, it becomes a major expense and a pain in the neck to come to your party. Not everyone has a grandma living next door. Most people have to hire and pay for a babysitter. Yes, it was their choice to reproduce. It doesn't mean that finding a babysitter during the busy holiday season is easy, especially when your employees are scheduled for multiple holiday events. On the flip side, if you invite children, the holiday party can turn into a kids' party, which is fine if your staff is comprised of only families. But this is likely to leave your childless employees feeling like they aren't even guests at the party. If you're thinking that you can't win on this, you're right. If your party requires babysitters, the people with small children may feel put out, and if you have a family party, your childless employees will feel overlooked and undervalued. The key here is knowing your employees and asking what will work best for them. Remember the party isn't about you, it's about rewarding your employees for their contributions. A party is only as good as the food and drink, and if you rent the fancy hotel ballroom and then cheap out on the food, people will be annoyed. Additionally, you can no longer just assume everyone can eat everything. You need to take the major allergies into consideration and have vegetarian and (sometimes) vegan options available. Yes, it's impossible to meet every little dietary consideration, but you need to try. If your business is small, you should be able to meet everyone's needs. In a larger group, consider having people pre-order, or make the menu available in advance so that people don't show up to a party they where they can't eat anything. Or, make the dinner a buffet with a variety of choices to meet the needs of every employee. Many companies have parties where you don't have to come, but, if you don't come, the managers will note your failure to attend and hold it against you. “Jane isn't a team player—she didn't even come to the holiday party.” If you are going to hold non-attendance against people, then make that clear. Don't say attendance is voluntary and not mean it. Employees will certainly figure this out. Additionally, keep in mind that there are plenty of people who have religious or personal reasons for why they may not want to attend a party. If it's labeled a Christmas Party, you may have employees of other religions who feel left out. If you have free-flowing alcohol, you may have a recovering alcoholic on staff who would rather not attend. Make attendance at holiday parties truly voluntary. 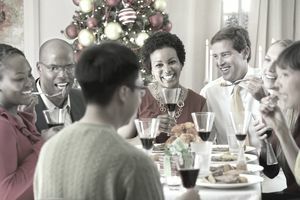 Excess imbibing in alcohol doesn't have to be everyone to make the holiday party uncomfortable. When everyone knows that the marketing manager is going to get sloshed and make a fool of himself, no one wants to see it happen. When the director of sales has too much to drink and forgets her sexual harassment training, her behavior can open up the company to potential liability. Additionally, if you serve alcohol, you need to provide a way that ensures that people will get home safely. That's pretty much the limit. The employees don't want to hear a year-end report or a critique of the latest advertising campaign. They don't want to hear your innermost thoughts on the plan for the future. Save those for a meeting. Executives should keep their mouths shut at the holiday party. It's okay for a manager to have a party and just invite her direct reports. It's not okay, for the CEO to throw a party and invite only certain people (unless it's just her direct reports). While people aren't paid the same amount of money, it's not a good message to send your lower level employees that they aren't good enough for the cool party. Remember Miss Manner's rule of gifts at the office: They go down, not up. That means the CEO never, ever, gets a gift from her employees. At the most, they can give her a card, a group box of chocolates, or homemade cookies, but never anything beyond that. Don't hold a party where employees are expected to shower the senior team with gifts and praise. It should always go the other way. Polly-Anna's, White Elephant Exchanges and Secret Santas are fun as long as participation is truly voluntary (see above) and there is a price limit that is strictly enforced. Never, ever, question why a coworker is not participating. “It's only $20,” you might say. But you don't know if your coworker is managing a mortgage on her own because her husband just got laid off and her mother-in-law has just moved in. Remember, fun activities are only fun if they are voluntary. If your employees aren't jumping for joy at the announcement of this year's holiday party, look at this ten-item list and figure out what you're doing wrong. Make sure that you fix your errors to ensure that your employees ​enjoy the work-related holiday season.